On Saturday, March 11, 2017, more than 20 students from the TZHS History Honor Society accompanied by social studies teacher Matt Robertson attended the Lower Hudson Valley’s Regional History Day Contest. 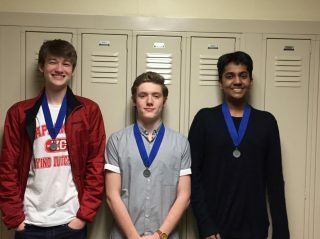 Juniors Eli Gordon, Jake Laddis, and Ruben Sriskanda placed second for their original website entitled “The Unlikely Community,” which was created in order to share the stories of those who stood up to discrimination in the Stonewall Riots and the subsequent mobilization of the Gay Rights Movement in the latter part of the 20th-century. Other projects of commendation included group documentaries on Thomas Paine and Dorothea Dix, a research paper on the role of social media in the Arab Spring, exhibits on the Easter Uprising, Mohammad Ali, and Rosa Parks, and a performance relating to Charles Martel and his role at the Battle of Tours. Each of these projects highlighted the theme of Taking A Stand in History, which was this year’s focus for the contest. The students’ hard work and dedication to crafting their projects was truly exemplary and the second place winner (website) is now eligible to compete in the State Contest in April. The participating students will be speaking about their projects in May at the high school’s History Honor Society Induction Ceremony.